Description: Thallus grows from a discoid holdfast forming flat blades with pointed apicies, up to 25 cms long, clear mid-rib and latteral veins. Blades undevided, further blades growing from from the stipe and not from the blade. Habitat: Common. 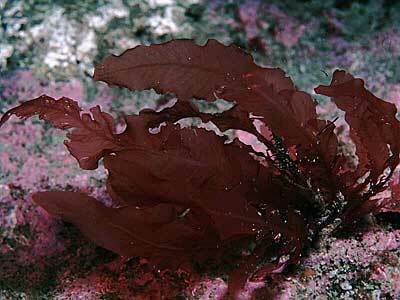 Epilithic or epiphytic on Laminaria in low littoral pools and in the sublittoral to a depth of 30 m or more. Distribution: British Isles on all coasts save parts of east England. Europe: Portugal, Spain, France, Faroes, Norway and Iceland. Similar Species: Phycodrys rubens is easily distinguished by the margins of the lamina which in Phycodrys is serrated and produces large lobes like the primary lamina. Frond leaf-like with mid-vein and side veins, the blade without serrations or lobes. Morton, O. & Picton, B.E. (2016). Delesseria sanguinea (Hudson) Lamouroux. [In] Encyclopedia of Marine Life of Britain and Ireland.